Platform bird feeders are the most non-selective type of bird feeders because they allow easy access by all birds. The bird seed is simply poured into an open platform or tray that basically any bird can access. The platform bird feeder will attract the widest variety of species as well as the most numbers of birds. Visitors may include finches, chickadees, cardinals and when placed low, will attract ground feeders such as juncos, doves, and sparrows. This type of feeder is nice also because you are not restricted by the type of seed or any kind of bird food product (fruit, suet, bluebird nuggets) to be used in the feeder. 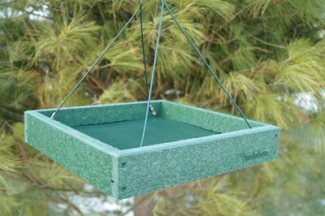 Below is a great new platform feeder made from 90% post-consumer recycled plastic. It's easy to clean and has a powder-coated metal screen to allow for drainage, keeping bird seed drier. Comes with a hook and cables for hanging. Our recommendation if you want to get a platform feeder is to get one that you can raise off the ground, if predators such as cats, dogs and other animals are a problem. Also, make or get a cover for your feeder if you have a lot of inclement weather so the bird food is not always getting wet. The pros of this kind of feeder is that it does allow any kind of bird to feed which is also a con. For some people, they do not wish to feed "non-desirable" species of birds such as starlings, house sparrows and blackbirds which is hard to eliminate with a platform feeder. Platform feeders also tend to be messy, hard to keep clean and if there is no cover, the bird seed will get wet when it rains or snows. However, the pros of this feeder outweighs those few cons for me. I certainly enjoy seeing the variety of birds my platform feeder attracts. 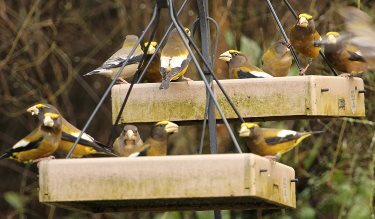 Remember to keep your feeders clean to prevent disease transmission and health problems. Also protect your birds from predators such as neighborhood cats. Birds are especially more vulnerable if you place your platform bird feeder on the ground. Platform Bird Feeder Plans - A couple of plans to build your own bird feeder. Wild Bird Food - Information about the different types of bird seed for your feeders. Photo of platform feeder with Pine Grosbeaks courtesy of Richard Probst.